Analysts disagree as to whether Pakistan's Prime Minister Benazir Bhutto was totally kept in the dark about the ISI's plan to overturn Afghanistan or was one of the instigators of this attack. One analyst stated that also United States Ambassador to Pakistan Robert B. Oakley was exhortating this mujahideen attack. The Americans reportedly were motivated by their wish to humiliate the Marxists and send them out of Afghanistan "clinging to their helicopters", thus avenge the fall of South Vietnam; Pakistan wished to retaliate against the Soviet Union as the latter had long unconditionally supported Pakistan's regional rival, India. The Taliban ruled most of Afghanistan until October 2001 when they were dethroned by a coalition of the United States of America with the Northern Alliance consisting of Jamiat-e Islami, Junbish-i Milli, Hizb-i-Wahdat, Harakat-i-Inqilab-i-Islami and the Eastern Shura. The UN and US fostered a new government led by Hamid Karzai, who was succeeded in 2014 by Ashraf Ghani. Nevertheless, as of January 2018, war was still raging in Afghanistan between the Taliban and the official government. ^ a b c d e f g "Afghanistan – the Squandered Victory". BBC. 1989. ^ The Demise of the Soviet Union, 1991 - Library of Congress country studies – Retrieved on 2007-08-21. ^ a b c d e The Fall of Kabul, April 1992- Library of Congress country studies – Retrieved 2007-07-26. Al-Badr (Arabic: البدر‎, al-badr "the full moon") is an Islamic militant group operating in the Jammu Kashmir region. The group was allegedly formed by the Pakistani Inter-Services Intelligence (ISI) in June 1998. It is believed the group was encouraged by the ISI to operate independently from their previous umbrella group, Hizb-ul-Mujahideen (HM). Prior to the group's separation from HM, they participated in the fighting in Afghanistan in 1990 as part of Gulbuddin Hekmatyar's Hizb-l-Islami (HIG) alongside other anti-Soviet Afghan mujihadeen. Government of India and the USA has declared and banned it as a Terrorist organisation. Balochistan(Balochi: بلوچستان) or Baluchistan is an arid, mountainous region that includes part of southern and southwestern Afghanistan. It extends into southeastern Iran and western Pakistan and is named after the Baloch people. The Haqqani network is an Afghan guerrilla insurgent group using asymmetric warfare to fight against US-led NATO forces and the government of Afghanistan. Maulvi Jalaluddin Haqqani and his son Sirajuddin Haqqani have led the group. It is an offshoot of the Taliban and are thought to be based in the town of Miramshah in Pakistan.The Haqqani network pledged allegiance to the Taliban in 1995, and have been an increasingly incorporated wing of the group ever since. In the past, the Taliban and Haqqani leaders have denied the existence of the "network", calling it no different from the Taliban.In the 1980s, the Haqqani network was one of the most favored CIA-funded anti-Soviet guerrilla groups by the Reagan administration. In 2012, the United States designated the Haqqani network as a terrorist organization. In 2015, Pakistan also banned the Haqqani network as part of its National Action Plan. The Laotian Civil War (1959–75) was fought between the Communist Pathet Lao (including many North Vietnamese of Lao ancestry) and the Royal Lao Government, with both sides receiving heavy external support in a proxy war between the global Cold War superpowers. It is called the Secret War among the CIA Special Activities Division and Hmong veterans of the conflict.The Kingdom of Laos was a covert theater for other belligerents during the Vietnam War. The Franco–Lao Treaty of Amity and Association (signed 22 October 1953) transferred remaining French powers to the Royal Lao Government (except control of military affairs), establishing Laos as an independent member of the French Union. However, this government did not include representatives from the Lao Issara anti-colonial armed nationalist movement.The following years were marked by a rivalry between the neutralists under Prince Souvanna Phouma, the right wing under Prince Boun Oum of Champassak, and the left-wing Lao Patriotic Front under Prince Souphanouvong and half-Vietnamese future Prime Minister Kaysone Phomvihane. Several attempts were made to establish coalition governments, and a "tri-coalition" government was finally seated in Vientiane. The actual fighting in Laos involved the North Vietnamese Army, U.S. troops and Thai forces and South Vietnamese army forces directly and through irregular proxies in a struggle for control over the Laotian Panhandle. The North Vietnamese Army occupied the area to use for its Ho Chi Minh Trail supply corridor and as staging area for offensives into South Vietnam. There was a second major theater of action on and near the northern Plain of Jars. The North Vietnamese and Pathet Lao eventually emerged victorious in 1975, as part of the general communist victory in all of former French Indochina that year. A total of up to 300,000 people from Laos fled to neighboring Thailand following the Pathet Lao takeover.After the communists took power in Laos, Hmong rebels fought the new government. The Hmong were persecuted as traitors and "lackeys" of the Americans, with the government and its Vietnamese allies carrying out human rights abuses against Hmong civilians. The incipient conflict between Vietnam and China also played a role with Hmong rebels being accused of receiving support from China. Over 40,000 people died in the conflict.The Lao royal family were arrested by the Pathet Lao after the war and sent to labor camps, where most of them died in the late 1970s and 1980s, including King Savang Vatthana, Queen Khamphoui, and Crown Prince Vong Savang. The Latin term bellum civile was first used of the Roman civil wars that began in the last third of the second century BC. The term civilis here had the very specific meaning of 'Roman citizen'. The English term civil war was first used in 1651 to refer to the English Civil War. Since the 17th century, the term has also been applied retroactively to other historical conflicts where at least one side claims to represent the country's civil society (rather than a feudal dynasty or an imperial power).The terms internecine war and domestic war are often used interchangeably with 'civil war', but 'internecine war' can be used in a wider meaning, referring to any conflict within a single state, regardless of the participation of civil forces. Thus, any war of succession is by definition an internecine war, but not necessarily a civil war. In modern geopolitics since 1945, 'civil war' is also used in a loose sense to refer to any large scale military conflict within a single country (i.e. used as a strict synonym of the generic term 'internecine war'), creating terminological overlap with insurgencies or coups d'état. This is a list of proxy wars. Major powers have been highlighted in bold. A proxy war is defined to be "a war fought between groups or smaller countries that each represent the interests of other larger powers, and may have help and support from these".The United Nations does not wage war (or proxy war), its peacekeeping military actions are instead police actions. General Mirza Aslam Beg (Urdu: مرزا اسلم بیگ; born 2 August 1931) LOM, NI(M), HI(M)), SBt, TeJ, also known as M. A. Beg, is a retired four-star rank army general in the Pakistan Army, who served as its Chief of Army Staff from 1988 until his retirement in 1991. His appointment as chief of army staff came when his predecessor, President General Zia-ul-Haq, died in an air crash on 17 August 1988. Beg's tenure witnessed Benazir Bhutto as being elected Prime Minister in November 1988, and the restoration of democracy and the civilian control of the military in the country. Controversial accusations were leveled against him of financing the Islamic Democracy Alliance (IDA), the conservative and right-wing opposition alliance against left-wing PPP, and rigging subsequent general elections in 1990. As a result of general elections, Nawaz Sharif was elected Prime Minister in 1990, but fell out with Beg when the latter recommended support for Iraq during the Gulf War. Beg was denied an extension from President Ghulam Ishaq Khan soon after in 1991, and replaced by General Asif Nawaz as chief of army staff. Apart from his military career, Beg briefly tenured as professor of security studies at the National Defence University (NDU) and regularly writes columns in The Nation.Beg's post-retirement has been characterized by controversies: first, Beg was accused of playing an internal role in the airplane crash that killed President Zia, and, second, he was summoned to the Supreme Court of Pakistan in 2012 for his alleged role in releasing the financial funding to the conservative politicians as opposed to the Pakistan Peoples Party's politicians during the general elections held in 1990. Nur ul-Haq Ulumi (sometimes spelt Noorolhagh Oloumi, Noorol Haq Olomi or Noorulhaq Olumi) (born 15 August 1941) is an Afghan politician, who served as a Member of the House of the People from 2005 to 2010 representing Kandahar. He is currently the leader of the National United Party of Afghanistan, a small left-wing and secular party in Afghanistan that is a member of the National Coalition of Afghanistan. Ulumi previously served in the Afghan Army as a member of the Parcham faction of the People's Democratic Party of Afghanistan. during the Afghan Civil War (1989–1992), and left service with the rank of lieutenant general. 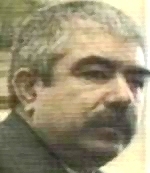 Rovshan Javadov (Azerbaijani: Rövşən Cavadov, 19 October 1951, Lachin – March 17, 1995, Baku) was an officer in the Azerbaijani Armed Forces and the chief of the Special Purpose Police Detachment of Azerbaijan (OPON). Born in what was then part of the Soviet Union, Javadov fought in Afghanistan before beginning his political career. He took on an early role in the early years of the newly independent Azerbaijan, becoming the leader of OPON, a military police unit of a few thousand people. The creation of the organization would lead to clashes with President Heydar Aliyev. In 1995, this conflict with Aliyev would eventually culminate into an attempted coup against Aliyev, which would fail and lead to a siege of OPON headquarters. During the siege, Javadov was shot and eventually died of his wounds. The Sarandoy or Sarondoy ("Defenders of the Revolution") were a militarized gendarmerie force of the Soviet-backed Democratic Republic of Afghanistan in the 1980s, during the Soviet–Afghan War. During the nine-year Soviet–Afghan War in the 1980s and the subsequent Afghan civil war, the town of Khost was besieged for more than eleven years. Its airstrip's 3 km runway served as a base for helicopter operations by Soviet forces. Operation Magistral was an offensive launched to relieve it at the end of 1987. The first convoys reached Khost at the end of December 1987. When the main Soviet force had withdrawn, Mujahideen groups cut off Khost once again, as they had done since 1981. Following the creation of the Commander's Shura, which united the Peshawar Seven and assault was coordinated to capture Khost, an assault which at least according to former special envoy to the Mujahideen Peter Tomsen was more an ISI operation than a Mujahideen one. This fighting was a co-ordinated attack by the forces of Hezb-e Islami of Gulbuddin Hekmatyar, Jalaluddin Haqqani and local Ahmadzai tribes led by Mohammad Nabi Mohammadi. The Ahmadzai were able to spearhead the assault after Hezb-e Islam and Haqqania suffered setbacks, and eventually able to capture the city and negotiate the surrender of the garrison resulting in victory on April 11, 1991. The Slovak–Hungarian War, or Little War (Hungarian: Kis háború, Slovak: Malá vojna), was a war fought from 23 March to 31 March 1939 between the First Slovak Republic and Hungary in eastern Slovakia.